A new group of pastoral carers has been commissioned for service in Brisbane Archdiocese after completing training offered by Centacare. Source: The Catholic Leader. 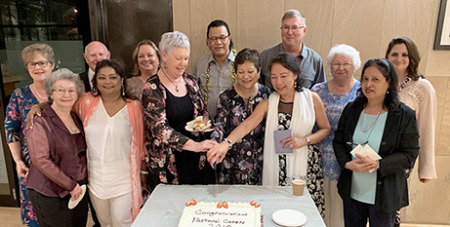 Pastoral ministries director Judy Norris said Centacare introduced the course this year after the closure of the Multifaith Academy for Community Ministries which had trained hospital pastoral carers for the past 25 years. About 70 people attended commissioning Mass at St Stephen's Cathedral, including those being commissioned, their families and hospital supervisors of other Christian traditions. Royal Brisbane and Women’s Hospital chaplain Marist Fr Michael Carroll was principal celebrant of the Mass. Gympie parishioner Helen Long, who was among those commissioned, said she hoped the formation would help her as a volunteer in the parish community. She had been volunteering at Little Haven Palliative Care for about a year and that was one of the reasons she enrolled in the Centacare course. “I’d got involved (at Little Haven) through knowing people with cancer,” Ms Long said. She said she had been “journeying” with people with cancer, and had been taking Communion to the sick and elderly. De La Salle Brother Brian Cunningham will continue as a pastoral carer at Logan Hospital after having completed the Centacare course. As part of the course, e was supervised for 100 hours at the hospital, where he and two other parishioners from Kingston-Marsden were pastoral carers among 26 chaplains from various denominations. “I look forward to promoting the course next year,” Br Cunningham said.